Some say that love makes the world go round. While that is a grand ideal, practically speaking, I submit that the collective birth of new ideas is what keeps the world spinning. Even farfetched notions have a way of taking hold and before a collective ‘whatttt?’… is sounded, those ideas are adopted by a culture and made a reason for living. I recently demonstrated this to myself while researching on my ipad – flying internationally. Here’s a new idea to try on for size – plant spirits can communicate with us, if we so allow. While there is a truckload of evidence that a subculture exists for the support and study of plant communication, possibly few have stopped to consider the value of such an endeavor, even those who work with plants every day. Once I attended a lecture on this matter and was informed that I was closely linked to the cucumber. Sadly, my reaction was to dismiss myself in search of another more self-affirming plant twin. Couldn’t my soul seed sister rate as a lovable tomato or an exotic artichoke? Recently I had the chance to reconsider. Innocently planting two cucumber plants in my novice garden, I, a human with cucumber like implications, reaped monumental connections within the plant kingdom. In fact, in just two weeks, I harvested over forty of the most perfectly formed and refreshingly sublime green orbs. Verifying the download of my earlier class, I observed that this amazing proliferation occurred without chemical enhancements. Evidently all that was required was a daily chat among the prickly vines. “Wow, I can officially can get a booth at the farmer’s market,” I said. “Well, not quite,” said Dalton. No worries, even if I turn out to be a one trick pony gardener, I’m perfectly satisfied with the continuation of my private cuke conversations. Aside from the uplifting nature of their crunchy goodness, it appears that cucumbers are quite talented as cited in a popular group email. Besides deterring pests, removing cellulite, curing hangovers, and cleaning stainless steel, some testify that the veggie can serve as a natural WD40 and ink eraser. Just imagine – and to think that my personal experimentation only allowed for the occasional eye patch. When I was small, nothing would thrill me more than a cucumber sandwich. A necessity on the lovely lady buffet, I longed for delicately salted cucumbers carefully placed on circulars of white bread, swathed in homemade mayo. 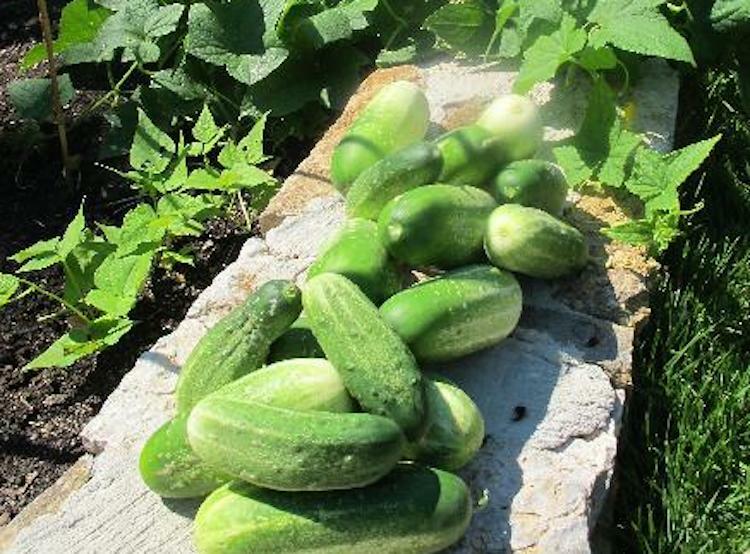 By junior high, I was preparing and consuming gallons of marinated cucumbers each summer. Possibly by this point, someone should have alerted me to the fact that the cuke and I had a thing going on. My adult self has now made peace with the fact that indeed; the cucumber has served me well. Inspiration, spit shine and nourishment. What more could you want in a person err… a vegetable? Unless, it is the perfect recipe. Peel, seed and chop cucumbers. Add all ingredients except sour cream and cream of wheat. Gradually add in cream of wheat. Boil very slowly uncovered for 20 minutes. Allow to cool and then puree. Return to pan and thin with milk. If serving col, beat in sour cream.